A friendly and comfortable property, the International Palms Resort offers great facilities and a prime beachfront location. You’ll be able to enjoy exploring Cocoa Beach’s main attractions, all easily accessible from the hotel, such as the Kennedy Space Centre to the Cocoa Beach Pier. This is a great base for family holidays, with a games room and arcade, family-friendly dining and a pirate ship-themed pool. For the adults, there is a 10-person Jacuzzi and fitness centre, as well as a chic lounge and heated outdoor pool for relaxing in the sun. Top tip: Check out the Flagship Ron Jon Surf Shop on Cocoa Beach – you can even arrange some surfing lessons. 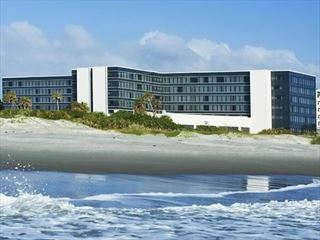 This family-friendly hotel is located along the golden sands of Cocoa Beach, a beautiful coastal area close by to the Kennedy Space Centre.